If the normal Minecraft PE world seems too easy, then you need a "hostile world mod". Friendly mobs, such as chicken and cows, is now much more dangerous, because they can defend themselves. Efficacy of food and other items were significantly reduced to increase the complexity of the game. All mobs are now able to defend themselves. For example, before you can attack the cow and not being afraid. 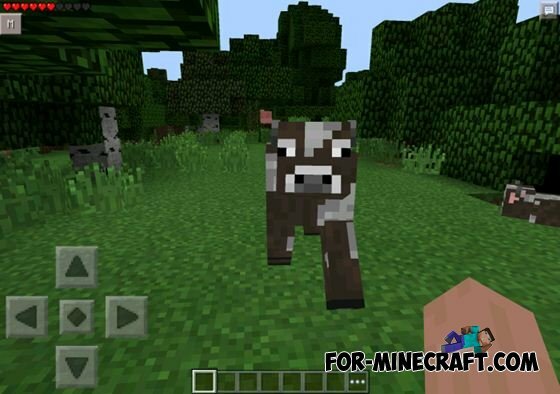 But now attacked the cow will pursue you and to call for assistance from other mobs nearby. Restoring the health of the use of food has been reduced. All food is now reduced only one heart. The process of extraction of ore is associated with danger. Each extraction of ore will appear one chicken creeper. If your inventory will be explosive, cake, and flint and steel, then the character will instantly explode.